Wealthy Europeans have been quietly flocking to Luxembourg’s insurance companies since the 2008 financial crisis, in order to take advantage of its particular type of insurance-based, single-premium savings products. All-but-unnoticed by Europe’s mainstream English-language business press – in spite of the fact that the combined premium income of the companies in question alone last year totalled some €1.2bn – two Luxembourg insurance companies announced at the end of June that they were planning to join forces, to create a new, stronger and more competitive entity. Foyer SA, one of the Grand Duchy’s oldest and largest privately-owned financial groups, said it would acquire International Wealth Insurer (IWI) from Belfius Insurance, a state-owned group, for an undisclosed amount. The deal was finalised in August. The idea behind the merger, according to the company, was to combine a Foyer subsidiary, Foyer International, with IWI, as both companies specialised in a particular type of wealth insurance product sometimes referred to as “privatbancassurance”. This term, which is said to have been coined by a rival Luxembourg insurer some years ago, refers to a type of insurance product that combines private banking and investment management services with a distinctively Luxembourghese, single-premium life insurance structure. 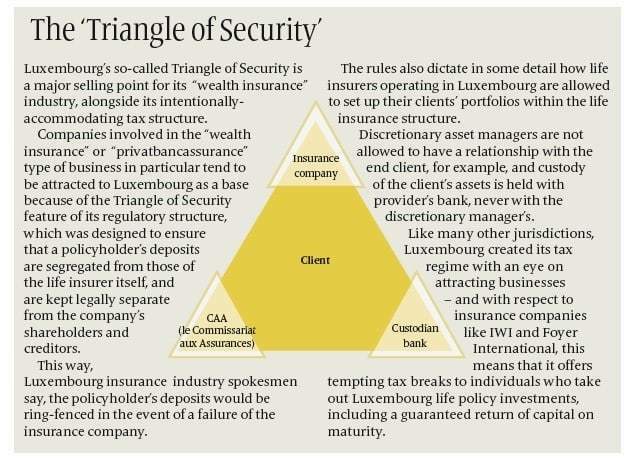 In addition to the Triangle of Security, Luxembourg’s other advantages for companies like IWI and Foyer include its 70 double-taxation agreements, and geographical location in the centre of Europe. Once merged, the new company – which for now is being referred to in company literature as “New Merged Entity” – will, company executives say, aim to bring the IWI/Foyer International insurance investment range to 11 European countries, including the UK, as well as Switzerland and certain niche overseas markets, such as Israel and Latin America. Luc Rasschaert, chief executive of IWI (pronounced “eee-wwweee” by those in the know) says being a larger player will give the New Merged Entity the strength to enter new markets that neither IWI and Foyer International would have been easily able to enter on their own. “Eventually we will try to add new services,” Rasschaert, (pictured), told International Investment. Rasschaert agreed to talk to International Investment even though, as he and other company executives are quick to point out, many details about the new business have yet to be worked out, its name not least of all. What is known is that redundancies, at least on a major scale, aren’t envisaged as a result of the merger, as the main purpose of the deal was not about cutting costs, Rasschaert said. Instead, IWI and Foyer International executives will be looking to combine and strengthen their specialist teams, in order to make them better able to deal with new levels of supervision, and advise on complex wealth structures that may include assets unfamiliar to them, such as private equity, Rasschaert explained. Synergies are also expected to be achieved as the two companies, which already complement each other in many ways, are brought closer together, Rasschaert went on. At the same time, he noted, like all of Luxembourg’s wealth insurers – “wealth insurers” is a term IWI executives frequently use to describe the types of “insurance” companies, like theirs, that specialise in products that are more about investments and savings than insuring against accidents, illness, theft and so on – IWI and Foyer International have, for some time, been having to confront, and increasingly comply with, a growing raft of new regulations that are coming at them seemingly from all directions, and which are adding significantly to their operating costs. These include the OECD’s Common Reporting Standard; the US’s FATCA; and the EU’s fourth AML Directive. Looking at the two companies, it’s easy to see why someone, at some stage, saw a potential match made in Europe, at least, if possibly not quite heaven. IWI, for example, already has a strong presence in Italy, while Foyer International is all but non-existent there. Foyer International, though, is much stronger than IWI in the Nordic markets, such as Sweden, Finland and Norway. Both companies are active in the Swiss, French and Belgian markets, which isn’t terribly surprising, given Luxembourg’s geographic proximity to these countries and their overlapping languages and cultures. However, their market share in each of these is only about 1% to 5%, and they have different distribution channels and partners, suggesting potential here, too, for synergies to be developed. As for the UK market, Rasschaert said its great appeal to IWI/Foyer International is its relatively large numbers of international investors, including non-doms. For this market, IWI has named the former head of development at AXA Wealth International, Mike Foxall, to advise on the best strategy for reaching this largely affluent, cross-border-living clientele. One of the first steps, Rasschaert acknowledged, will necessarily be to educate UK wealth managers and their clients about the Grand Duchy’s specialist wealth products, as until now, their penetration hasn’t been significant in the UK market, in part because it is well served by a number of major, UK-based and multi-national providers. However, he suggested that if a permanent office were to need to be set up in the UK to oversee the running of this market, it’s possible the costs could be too high to justify it. Foyer SA has been a prominent player in Luxembourg’s local insurance market since it was established there in 1922, providing Luxembourgers with life insurance, wealth management and non-life insurance products and services. The privately-held company was established by individuals whose families are still shareholders, which company officials say benefits its clients by ensuring a long-term perspective. The Foyer Group has a solvency ratio of 225%, which is considered a desirably high score. Formerly known as Dexia Life & Pensions, IWI is a subsidiary of Belfius Insurance SA, part of the Belgian state-owned group set up in 2011 when the Dexia group was dismantled. The company, which started out in general insurance, changed its name to IWI in 2012, when Luc Rasschaert took over as chief executive, and the company changed direction and began looking for a partner with which to grow its business. IWI now concentrates on HNWIs and UHNWIs, which it reaches through private banks, family offices, trustees and asset managers. It provides wealth management products for individuals and families in Europe under the freedom of services provision, and in Switzerland through a local branch. As it will be an entirely Luxembourg-based business, the merged group will be the only independent Luxembourg insurer with its decision centre actually located in the Grand Duchy. To read Peter Body’s story about how Luxembourg is reinventing itself for modern investors, as it shrugs off its lingering tax haven image, click here.